Wreaths or garlands as they are sometimes known are becoming more and more popular. Traditionally they have always been regarded as a winter design – hanging on doors at Christmas or complementing a fabulous mantelpiece over a roaring fire. But these days it’s very common to see them adorn walls, doors, hung over fireplaces and in shops, at other times of year. Autumn in particular is a fabulous time of year to enjoy a wreath. It’s harvest time so the occasion lends itself to a design filled with lots of dried material and richly coloured fruit. The textures and colours are perfect for autumn – lots of gold, yellows and oranges It also gives you as a florist the opportunity to sell something that is only usually seasonal at Christmas!.But there is absolutely no reason why you can’t have a wonderful dried wreath on your door during autumn – it is only tradition and lack of imagination that stops us. A harvest wreath welcomes people in just as we welcome the harvest in at that time of year. It is also a perfect gift for a church at this time of year. It would look fabulous on a church wall or attached to a pillar or pew. They could also double up as wedding decorations for that time of year – very versatile! Creating a wreath from scratch is actually very simple. All you need is lots of dogwood or willow (or other pliable twigs) which you can intertwine and twist into a circle. It can be secured with wired raffia. But this is admittedly time consuming and if you haven’t got access to a foliage wholesalers you might find the search for twigs more of a hassle than a pleasure. Florists’ wholesalers sell a wide range of decorative bases. Depending on what type of design you have in mind, you can buy wreaths made from straw, willow, vine, dogwood and other suitably pliable trees. Some come scented with lavender, herbs or spices and can either have a natural finish, coloured or glazed. The wholesalers will also have a fantastic selection of dried flowers, fruits, seed heads, foliage and ribbons or raffia to decorate. Decorative base, selection of dried flowers, foliage, fruit and seed heads, dry foam, moss, tape, ribbon, pins, glue gun. Decide on how you would like your wreath to look. Don’t try and overcook it. Keep the design simple and natural looking spray of dried materials and several bows look lovely. Cover the foam with moss, securing it into place with pins. Once this has been done, you can start adding foliage to create an outline to the design. The focal point should start in the centre of the foam (use your largest flower or seed head here) before making a diagonal line from right to left with the same type of material. Carry on adding the flowers and foliage in lines and groups using the longer stemmed materials to create a flow. Make sure you keep the shape of the design and try to elevate it slightly in the middle to give it visual depth. Add a bow with trailing ends to the design. You can glue this into position – in fact if you prefer you can actually glue all the materials into place for added security. 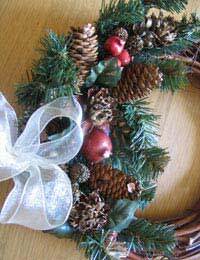 Loop a piece of ribbon and wire it securely onto the wreath for hanging. Alternatively you can buy door hangers from the wholesalers.